Say goodbye to brittle, breakable hair! Awaken your senses with this invigorating shampoo specifically designed to optimize scalp conditions for healthy, manageable hair. Natural botanicals locked within the Hair Thickening Shampoo will give you stronger, fuller hair with regular use and its fresh, invigorating scent will leave you ready to take on the day. 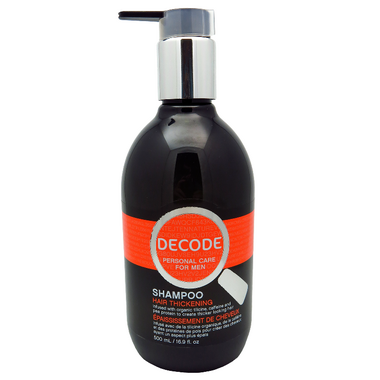 Use: Apply to wet hair and work into a rich lather, lightly massaging scalp area. Rinse and repeat for a deep cleansing. Ingredients: Aqua/Water/Eau, Sodium Methyl 2-Sulfolaurate, Cetyl Betaine, Cocamidopropyl Betaine, Glycerin, Pisum Sativum (Pea) Peptide, Coco-Glucoside, Glyceryl Oleate, Caffeine, Tilia Tomentosa Bud Extract, Guar Hydroxypropyltrimonium Chloride, Panthenol, Polyquaternium-55, Natural Parfum/Fragrance, Benzyl Alcohol, Benzoic Acid, Sorbic Acid, Sodium Benzoate, Potassium Sorbate, Sodium Hydroxide. Wow! I used it once and got compliments on the way my hair looked and smelled. I love my hair after i use this. It looks and feels beautiful.